Stefano Manfredi’s world class seaside restaurant retreat, Manfredi at Bells, is embarking on a new era as Tuscan born Marco Ribechini is welcomed to the team. Appointed as the new Head Chef at Manfredi at Bells, Ribechini’s arrival coincides with the hire of new Food and Beverage Manager, Adam Lambeth, previously at Tetsuya’s. The two experienced heads will team with Manfredi’s creative vision to maintain its position as one of the world’s best country hotel restaurants, and an exciting and unique destination for coastal residents and visitors to the area. Ribechini, once familiar to Sydney’s Italian restaurant scene, cooked alongside Manfredi 16 years ago followed by tenure at Giovanni Pilu’s Cala Luna before heading back to his hometown. Manfredi has been following Ribechini’s journey ever since. “Marco and I worked together some years ago in one of my restaurants. He then went back to his hometown of Lucca in western Tuscany and opened his own restaurant, along with his wife Lee as sommelier. 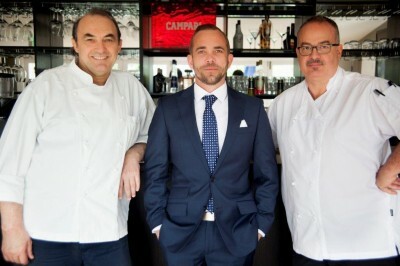 I’ve visited him there and had wonderful food, including a lunch featuring their local white truffles,” says Manfredi. After eight successful years running his own restaurant, Villa Bongi, Ribechini returns to Australia with his family to share in Manfredi’s conceptual interpretation of modern Italian cuisine. Ribechini’s approach to cooking hold the same intrinsic values as Manfredi’s; grow as much as you can on the property and make virtually everything in the kitchen including breads, pastries, gelati and so on. Set amongst manicured gardens, Manfredi at Bells occupies the main building of Bells at Killcare with its ‘Hamptons styled’ main dining room, The Conservatory for events and weddings and a number of other smaller private dining spaces, including cocktail bar, lounge and covered veranda. The Manfredi at Bells menu is grounded in core values of simplicity and freshness featuring seasonal dishes inspired by the produce grown and harvested in the estate’s now famous vegetable garden. It was this garden – now some 500 square meters and supplying the restaurant with more than 15% of the produce on its menu – that saw Manfredi at Bells honoured with the Good Living Sustainability Award at the 2012 Sydney Morning Herald Good Food Guide Awards.